April is National Frog Month, and rightly so! Anyone who lives anywhere near a natural frog habitat knows that April is when they come out of their winter slumber and begin looking for a mate. Springtime goes hand-in-hand with frogs, so try one of these totally fun frog crafts with your children! Below are 10 of our favorites. 1. Button Frog – Turn buttons and wire into the cutest little frog! This fun craft is easy to do and takes just a few minutes. 2. Sparkly Frog – Use styrofoam, paint, and a few other supplies to make this super cute froggie. 3. Foam Cup Frog – Make an adorable frog using a foam cup. It’s lots of fun and each frog has so much personality. 4. Oreo Pretzel Frogs – Pretzels, Oreos, and candy melts? Yum! These frogs are a super easy treat that people of all ages will love. 5. Frog Prince Container – Transform a milk container into the Frog Prince. It can hold small toys, cards, or other trinkets. 6. Frog Baseball Hat – With a little paint and some felt, you can transform a green baseball hat into a frog. It’s fun for everyday wear or as part of a costume. 7. Egg Carton Frog – Don’t throw out that egg carton! Turn it into a whole swamp’s worth of little frogs. 8. Watermelon Frog – Turn a watermelon into a frog, complete with a ‘fly’ on its tongue. So cute! 9. Frog Pops – Even the smallest of crafters can help turn marshmallows and candy into these yummy froggy treats. 10. Paper Bag Frog Puppet – First, make some frog puppets. Then put on your own puppet show for friends and family! These are just some of the many great frog crafts at Fun Family Crafts. 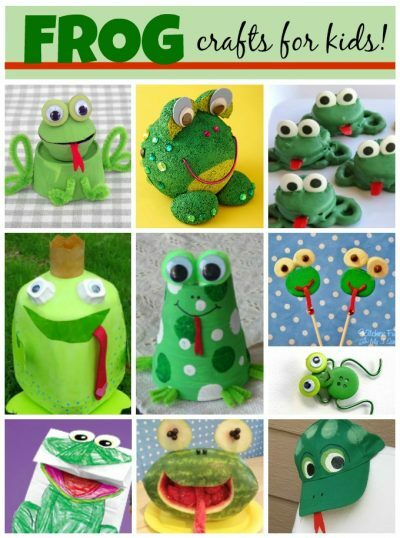 Be sure to check out all the frog crafts for kids!